"Everyone that I interacted with was very nice"
"The men treated my home as if it were there own!" The men treated my home as if it were there own! Very satisfied with the job. The presentation was good, he was very personable. Very satisfied with the job. The installation team were excellent ! They are friendly, efficient, clean and answered my questions. To be honest, I was not aware this could be accomplished, saw your ad on the money mailer. You were the only company I have ever needed to advertise the service. Jeff, the System Design Specialist, was very professional and a wealth of information and was very helpful. The installation team were prompt and quick yet thorough and clean. Very satisfied with the job. We had been looking to fix the concrete problem for about 5 years before getting a quote from Quality 1st. The System Design Specialists presentation was very informative and the installation team was the best. Jeff was courteous & professional, excellent presentation. The installation crew, Arturo and Angel, were great as they explained how the process worked and they cleaned up the area nicely. Jeff has experience in home improvement with covered gutter systems which gives him a good understanding of the importance of waterproofing. His experience has given him a good understanding of the importance of providing a thorough inspection to make sure all the homeowners concerns are addressed. He enjoys helping homeowners keep their homes safe and free from trip hazards. At the inspection, Jeff explains to customers how they can accomplish their concrete lifting and leveling goals. He guides each homeowner through the entire process from start to finish. His attention to detail, customer service, and extensive product knowledge make him a tremendous asset to the Quality 1st team and to each homeowner he meets. In his spare time, Jeff likes spending time with his son, boating on Lake Hopatcong, riding motorcycles and ATVs. He also enjoys watching football. PolyLevel is injected beneath the sinking slab raising it back to level. The Polyurethane foam is waterproof and environmentally friendly! A homeowner in Voorhees, New Jersey noticed their driveway was settling 1-2 inches and contacted Quality 1st for a solution. Our System Design Specialist inspected the driveway and sidewalk and noticed the settlement. PolyLevel was installed to raise the concrete back to its original position. PolyLevel is a polyurethane foam that is injected into the concrete through penny size holes and begins expanding within minutes to raise the concrete. PolyLevel is fast, easy and a permanent solution for concrete lifting and leveling. A homeowner in Little Egg Harbor, New Jersey noticed that their concrete driveway was cracked and settled more than an inch. Quality 1st used PolyLevel, a polyurethane foam to lift the settled driveway. PolyLevel is injected into the concrete through penny-size holes and the foam starts to expand. Within 30 minutes, the foam expands, the slab begins to lift and returned to its original position. These homeowners were amazed by their driveway transformation. A homeowner living in Hopewell, NJ contacted Quality 1st Basements when they started to see their pool slabs sinking. The slabs had sunk around 3 inches, making the pool area extremely uneven. Quality 1st injected PolyLevel underneath the sinking slabs, raising them back to level. The pool area was now stabilized and the homeowner could now close their pool for the winter. A homeowner living in Hopewell, NJ had noticed that the concrete slabs surrounding their pools had settled about two inches. Looking for someone to help solve their problem, the homeowner contacted Quality 1st Basements. System Design Specialist, Jeffrey Pitek, examined the concrete slabs and proposed PolyLevel to fix the homeowner's problem. Project Manager, Sha Con Kasey, and his crew injected PolyLevel into the concrete slabs, leveling each one. 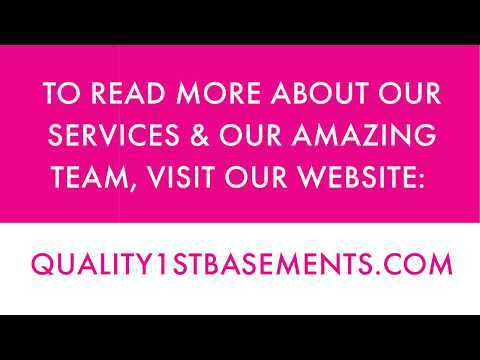 The homeowner was amazed with the installation process and always recommends Quality 1st Basements! A homeowner in Hopewell, New Jersey had 1-3 inches of sinking concrete around their pool and contacted Quality 1st for a solution. Our team used PolyLevel, a polyurethane foam that was injected into the concrete through small holes, to help lift it back to its original position. PolyLevel begins working within minutes and is a permanent solution for sinking and settling concrete. The homeowners do not have to worry about trip hazards around their pool this season! A homeowner living in Flemington had concrete slabs on their patio that had sunk about three inches. Looking online for a solution, the homeowner found and contacted Quality 1st Basement Systems. System Design Specialist, Jeffrey Pitek, examined the homeowner's patio and suggested PolyLevel. PolyLevel is both lightweight and won't result in mismatched concrete colors making it the perfect solution for patios. The Project Manager and his crew injected PolyLevel into the concrete slabs, evening it out the homeowner's patio. With the concrete slabs raised, the homeowner could enjoy their patio. The Homeowners living in West Creek, NJ noticed that their front porch was beginning to sink and settle. Luckily their neighbor knew Quality 1st Basement Systems was known for lifting and leveling concrete and gave them the number to call. Quality 1st Basement Systems was able to set up an appointment with Concrete Repair Specialist, Jeff Pitek, who did a full inspection of the porch. He measured about 1 inch of settlement in some sections of the porch while other sections had a little over 2 inches. Jeff reassured the homeowners they would not have to replace their porch because PolyLEVEL System could raise and stabilize it. The homeowners were amazed at the process to lift and level their porch and was happy they were able to enjoy it within 15 minutes of the porch being raised. Our team was able to lift, level and stabilize the front porch of this West Creek, NJ home using our PolyLevel System! Homeowner contacted Quality 1st Basement Systems after seeing an Ad for Concrete Lifting and Leveling. Concrete Repair Specialist, Jeffrey Pitek inspected about 4 inches of settlement. The Q1 team was able to lift and level the stairs, permanently stabilizing them using PolyLevel. A small hole is drilled into the concrete steps and PolyLevel was injected underneath to raise the slab back to its original position. Within 15 minutes of job completion, the homeowner was able to use his front steps. This homeowner now has a much safer walkway thanks to our PolyLevel Team! PolyLevel Foreman, Richard injected the polyurethane form beneath the concrete slabs, filling the void underneath. When the void was filled the PolyLevel form begins to harden, expanding to lift the slab. Once the slabs were lifted, the gaps between each slab closed and were sealed with NexusPro Joint Sealant. The Joint Sealant is meant to keep the concrete from experiencing any future erosion that could cause them to settle again. A homeowner in Manahawkin, New Jersey had a settling driveway slab and contacted Quality 1st for a solution. Our System Design Specialist inspected the driveway and noticed the settlement. Our Specialist recommended that PolyLevel be installed to raise the slab back to its original position. PolyLevel is a polyurethane foam that is injected into the concrete through penny size holes and starts raising the concrete within minutes. The foam begins expanding and hardening and the driveway is able to be used shortly after installation. PolyLevel is easy to install and a permanent solution. A homeowner in Lacey Townnship, New Jersey noticed that their concrete slab around their pool was sinking about 2 to 3 inches. This happens when the weight of the concrete and water become too much for the soil to bear. Quality 1st used PolyLevel, a polyurethane foam, to raise the concrete back to its original position. Within 30 minutes, the foam begins to expand and lift the concrete. The homeowners were very pleased with their improved area around their pool. Quality 1st Basements removed this giant trip hazard in the pool area of this home in Lacey Township, NJ. Our team injected PolyLevel foam beneath the sinking slabs, to raise and stabilize them. The installation begins with the team drilling small penny-size holes into each sinking slab. Using special equipment, the PolyLevel foam is then injected underneath to fill the void between the concrete and soil. The foam expands then hardens, lifting the concrete slab back towards its original position. This homeowner noticed that their concrete was sinking and causing trip hazards in the area leading to their dock. Jeff, our Concrete Repair Specialist, recommended that PolyLevel was the perfect solution to their problem. Our team went out and injected PolyLevel beneath the sunken slabs. The Polyurethane foam raises the slab back towards its desired level. Now the homeowner can enjoy their backyard and bring friends and family on their boat without worrying about them tripping over uneven concrete. This Toms River, NJ homeowner contacted Quality 1st Basement Systems after receiving a coupon in the ValPak for concrete lifting and leveling. Concrete Repair Specialist, Jeff Pitek, recommended PolyLevel to lift and level the entire pool deck slabs around the pool area. Homeowner living in Manalapan, NJ noticed the front steps to their home had began to settle and crack. Searching the internet, they came across before and afters of front steps being raised by PolyLevel on the Quality 1st Basement Systems Website. They contacted us for a free estimate and within a few shorts days, System Design Specialist, Jeff Pitek was out to inspect the stairs. Quality 1st Foreman, William and his crew were able to lift the stairs back to it's original position. Trip Hazards are a problem in the past! With PolyLevel, we can lift and level each sinking slab, removing all tripping hazards! Craig from Freehold, NJ contacted Quality 1st Basements about a few trip hazards he had in his backyard due to sinking concrete. He wanted a solution that would remove the trip hazards without having to replace the concrete. Our Concrete Repair Specialist, Jeff P. recommended our Concrete Lifting and Leveling solution known as PolyLevel. PolyLevel is a light weight and waterproof foam that is injected beneath the slab to lift and level it back towards its original position. not only is the installation quick and easy but also causes no disturbance to the surrounding areas. Within just 15 minutes of completion, the concrete slab could be walked on or driven over. A homeowner was experiencing concrete settlement around their pool so they contacted Quality 1st Basements for a solution. Our Concrete Repair Specialist, Jeff Pitek, went out to inspect the entire pool deck area. After his full inspect where he saw no lift was caused by tree roots he suggested our concrete leveling system, PolyLevel. Our team went out to install the PolyLevel. First, they drilled penny sized holes into the concrete. They then injected polyurethane foam into the holes. As the foam was injected, it expanded beneath the surface and lifted the concrete back to its original position. Once the slab was raised, the holes were filled with concrete mix and the area was trip hazard free! The pool deck of this Howell, NJ home began to crack and settle around the pool area. The homeowners wanted to fix the slabs before closing their pool so they contacted Quality 1st Basement Systems for an estimate. System Design Specialist, Jeff Pitek, recommended PolyLevel, for it would provide a permanent solution without having to replace the concrete. Using PolyLevel, the Q1 team was able to lift each settled pool slab around the entire pool area. Quality 1st received a call from a Marlboro, NJ homeowner who was experiencing sinking concrete in the front of their home. The front side walk settled causing a tripping hazard. Arturo and his team drilled small penny-size holes into the concrete slab and injected PolyLevel which is a polyurethane foam underneath lifting the slab back to level. Within just 15 minutes of job completion the homeowner was able to use the walkway. A homeowner in South Plainfield, New Jersey had a sidewalk in front of their home sinking a few inches. The homeowners contacted Quality 1st for a free estimate for lifting and leveling concrete. Our Concrete Repair Specialist inspected the sidewalk and noticed multiple slabs had settled roughly 1 to 3 inches. Polylevel was used to lift the concrete back to its original position. PolyLevel is a polyurethane foam that is injected into the concrete through penny-size holes and starts lifting the concrete right away. Within minutes the PolyLevel begins expanding and lifting the sidewalk. PolyLevel is a fast, easy and permanent solution to concrete lifting and leveling. Edison homeowners contacted Quality 1st Basement Systems when they realized how dangerous their sidewalk had become to the neighbors. The sidewalk slabs had settled 6 to 8 inches causing a serious tripping hazard. Concrete Repair Specialist, Jeffrey Pitek, reassured the homeowners that the sidewalk slabs could be raised back to their original state with PolyLEVEL Foam while causing no disturbance to the surrounded area of their home. The homeowners were amazed at the outcome and were happy their neighbors were able to walk on the sidewalk 15 minutes after the job was done.